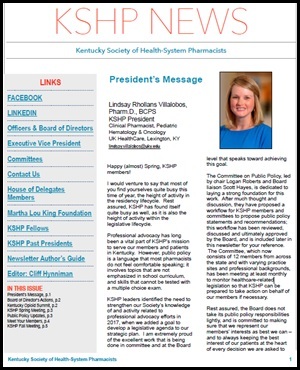 The Kentucky Society of Health-System Pharmacists (KSHP) is the membership organization that works on behalf of pharmacists in Kentucky who practice in hospitals and health systems. Since 1960 we have been on the forefront of efforts to improve medication use and enhance patient safety. Our advocacy efforts, publications, and educational offerings are designed to advance your practice as you improve patient care. If you haven't already please JOIN us in our efforts! 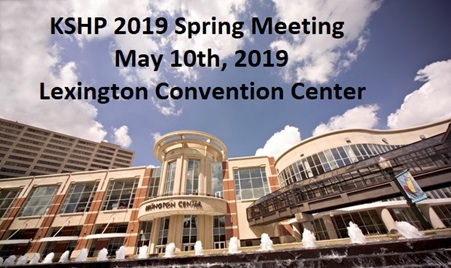 The 2019 KSHP Spring Meeting will be held in conjunction with the Kentucky Hospital Association on Friday, May 10, 2019 at the Lexington Convention Center. assured, KSHP has found itself quite busy as well, as it is also the height of activity within the legislative lifecycle. done in committee and at the Board level that speaks toward achieving this goal. statements and recommendations; this workflow has been reviewed, discussed and ultimately approved by the Board, and is included later in this newsletter for your reference. Rest assured, the Board does not take its public policy responsibilities lightly, and is committed to making sure that we represent our members’ interests as best we can – and to always keeping the best interest of our patients at the heart of every decision we are asked to make. 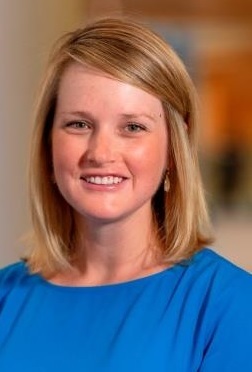 We are also committed to transparency and to improving communication regarding professional advocacy issues to our membership, as evidenced by utilizing this edition of the newsletter to highlight public policy information and recent activity. (KPhA) and our colleges of pharmacy on March 30th. Details are being finalized for our annual Spring Meeting, held in partnership with the Kentucky Hospital Association (KHA) on May 10th. We’ve also confirmed initial details for our annual Fall Meeting – keep reading to find our official “Save the Date”! Despite the busyness that this season brings for most of us, I do hope that you continue reading this newsletter today – and that you also make time to become informed on the public policy issues that have a potential to impact your practice and your patients. As always, please feel free to reach out to me or any of our leaders directly should you have any questions about professional advocacy or any other past, present, or future KSHP endeavors. I hope to see you all at our upcoming events this spring!